Aranmula, the picturesque village near Pathanamthitta district, 9 km west to Chengannur is famous as one of the five temple towns of Kerala. It is also famous for its metal mirror, a unique craft called Aranmula Kannadi and the famous Aranmula snake boat race. 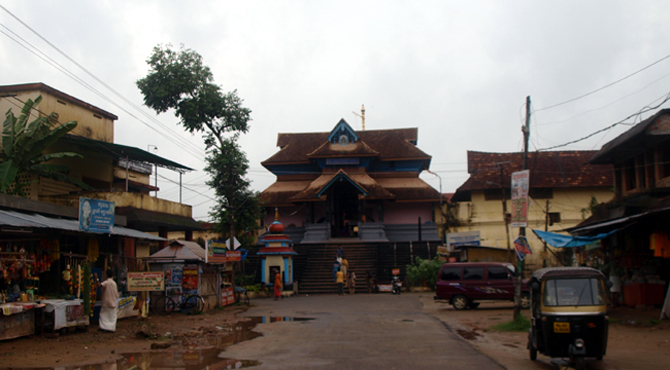 Sree Parthasarathy Temple is one of the most ancient and famous temple in Aranmula. The deity is Lord Krishna in the form of Parthasarathi and the idol has chakra in its hand. The temple is one of the 'Divya Desams', the 108 temples of Vishnu revered by the 12 poet saints. 16 km away from Pathanamthitta, this temple is located on the banks of the holy river Pamba. There are many legends associated with this temple. This temple is believed to be one among the five temples in Kerala built by the Pandava brothers. These temples (Divya Desams) are at Chengannur (Yuddhisthra), Tiruppuliyur (Bhima), Aranmula (Arjuna), Tiruvanvandur (Nakula) and Tirukkodittaanam (Sahadeva). These temples are now popularly referred to as 'Anj-Ambalam' by the devotees here. Aranmula temple is said to be built by Arjuna, who came here at the end of the Mahabharatha war to expiate for the sin of having killed his relatives, especially his brother Karna, on the battlefield, against the dharma of killing an unarmed enemy. Legend says that the temple was first built at Nilakal near Sabarimala and the image was brought here in a raft made of six pieces of bamboo. Thus the place derived the name Aranmula which means six pieces of bamboo. It is from the Parthasarathy temple that the Golden Amki (sacred jewel) of Lord Ayyappan is taken in a grand procession to Sabarimala every year. Brahmma is also said to have undertaken penance at this place. The Aranmula Parthasarathi temple round in shape is a simple structure in Kerala style of architecture and the idol of Parthasarathy is six feet high. The walls of the temple is beautifully adorned with fine murals of the 18th century. The temple has four gopurams (towers) on four sides of its outer wall. The eastern tower is accessed through a flight of 18 steps and a descend of 57steps from the northern tower leads to the Pampa river. Tulabharam, an age old practice, is one of the important rituals of this temple and one can see the big Tulabharam hanging as one enters the temple from the eastern side. Valla Sadya is another unique ritual. Each valla sadya is done as a vazhipad to the Lord Parthasarathy. It is from here that the sacred jewels of Lord Ayyappa are taken in procession to Sabarimala 2 days prior to the Mandala Vilakku during the Makara Jyothi period each year in Dhanu (December). The annual temple festival Brahmotsavam that lasts for 10 days is celebrated as the anniversary of the installation of the temple idol. A tradition of sending rice and other materials on a water boat as an offering for a feast to the nearby village relates to the origin of the festival and this tradition is continued even today. The festival commences with the kodiyettam (flag hoisting) and concludes with Arattu (the holy dip of the image of the deity) in the Pamba river. Garudavahana ezhunallathu is a colourful procession held during the festival where Lord Parthasarathy is taken on the garuda mount to the Pampa river bank with the accompaniments of caparisoned elephants, Panchavadyam and other traditional temple orchestra. The Valla sadya is an important vazhipadu (offering) in the temple at the time of the festival . Another festival celebrated here is the Khandavanadahanam in the Malayalam month of Dhanus. During the festival, a replica of a forest is created in front of the temple with dried plants, leaves and twigs. Then a bonfire is lit symbolizing the Khandavana forest fire of the Mahabharata. Ashtamirohini, the birthday of Sree Krishna is also celebrated in this temple. The temple is associated with an old water carnival, known as Aranmula Vallamkali or boat race. The festival which falls in the Malayalam month of Meenam, during the Onam season is the most famous of the many water festivals held in Kerala during the Onam Season.